Jews and Magic in Medici Florence: The Secret World of Benedetto Blanis: Who? What? When? 1492 All openly professing Jews are expelled from Spain (p.23). 1512 (no later than) Benedetto’s great-great-grandfather Doctor Moyse Blanis de Lerda (from Lerida, Catalonia) settles in Orvieto in the Papal State (p.23). 1564 (no later than) Doctor Laudadio Blanis the Elder (Benedetto’s great-grandfather) settles in Tuscany (p.24). 1567 Giovanni dei Medici is born (out of wedlock) to Duke Cosimo I and Eleonora degli Albizzi (p.11). 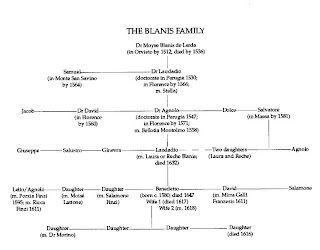 1571 Doctor Laudadio Blanis and his family take up residence in Florence’s newly mandated Ghetto (p.25). 1580 (circa) Benedetto Blanis (son of Laudadio the Younger and great-grandson of Laudadio the Elder) is born in the Florentine Ghetto (p.26). 1608 - 1609 The voting members of the Ghetto community issue a new set of by-laws, limiting the influence of the Blanis family in the Synagogue (p.48); they bring in a Rabbi from Venice, Leone da Modena (p.55). 1611 Benedetto, his father and three brothers are jailed and fined for smuggling a large quantity of second-hand clothing into Florence for resale (p.94). 1614 Benedetto makes the first of several illegal usurious loans to Jacopo Sernigi, a Florentine patrician, leading to a court battle that will later devastate the Blanis family (p.108). 1615 (before 20 June) Benedetto writes his earliest surviving letter to Don Giovanni dei Medici, for whom he had been doing “Jewish business” for some time (Letters, doc. 1). 1615 (June) Don Giovanni dei Medici becomes commander of the Venetian land army; he moves from Florence to Venice, accompanied by his mistress Livia Vernazza; Don Giovanni and Benedetto Blanis remain in close touch through regular letters (p.15). 1615 (July - ) Using Don Giovanni’s influence, Benedetto works to establish himself as a Hebrew teacher at the Medici Court (p.19). 1615 (November) Don Giovanni intervenes to help Benedetto collect an illegal usurious loan to Giovanfrancesco degli Albizzi, a Florentine Patrician (p.105). 1615 (November 8) Benedetto tells Don Giovanni that he is preaching weekly sermons in his home in the Florentine Ghetto (p.21). 1616 (January) Benedetto borrows a Tree of the Sephirot (a Kabbalistic chart) from an uncle in Lippiano and has a copy made for Don Giovanni (p.120). 1616 (February – May) Benedetto carries out an elaborate necromantic rite under the guidance of Samuel Caggesi, a Moroccan Jew who has settled in Florence (p.132). 1616 (March – November) Benedetto seeks Don Giovanni’s protection in the wake of a sensational gambling scandal in the Florentine Ghetto (p.145). 1616 (July – October) Benedetto organizes and catalogues Don Giovanni’s palace library in Florence (p.116). 1616 (November) One of Benedetto’s four children (all female) dies (p.72). 1617 (February) - 1618 (January) Don Giovanni is in the field with the Venetian army in the Friuli and largely out of touch with Benedetto Blanis; he returns to Venice seriously ill (p.158). 1617 (September) – 1618 (January) The Blanis family in Florence is struck by a series of grave illnesses; Benedetto is incapacitated for several months and his wife dies (p.155). 1618 (February - October) Benedetto is in Venice, living in Don Giovanni’s palace on the Grand Canal; they collaborate on The Mirror of Truth, an esoteric treatise. Benedetto consolidates his relationship with Livia Vernazza; he assists her with schemes to annul her first marriage, leaving her free to marry Don Giovanni (p.151). 1618 (August 21) Benedetto travels from Venice to Ferrara, evidently on a confidential mission for Don Giovanni; he appeals to Don Giovanni on behalf of his brother-in-law Salamon Finzi (resident in Ferrara), whose merchandise was destroyed in a recent fire at the Fair in Lugo (p.165). 1618 (October 17) Benedetto returns to Florence, where his father Laudadio has suffered a stroke and is partially paralyzed (p.167). 1618 (December) Benedetto remarries (p.167). 1619 (January 18) Cosimo Ridolfi, an influential Florentine occultist, dies (p.170); Benedetto begins a lengthy campaign to acquire Ridolfi’s library for Don Giovanni (p.183). 1619 (January) Benedetto borrows a Hebrew treatise on the Philosopher’s Stone attributed to Ramón Llull and begins copying it for Don Giovanni (p.175). He also borrows a Latin manuscript of the (spurious) Fourth Part of Cornelius Agrippa’s Occult Philosophy and arranges for a Catholic priest to copy it (p.177). 1619 (March) The priest who was copying Cornelius Agrippa’s Occult Philosophy has an attack of conscience; he reports this forbidden book to Monsignor Cornelio Priatoni, the Father Inquisitor in Florence (p.183). 1619 (April 14) Benedetto is summoned to the local headquarters of the Inquisition at Santa Croce; he is fined, sentenced to house arrest and given a stern warning regarding his various illicit activities (p.187). 1619 (May) Don Giovanni sends Ferdinando Magnani, an aspiring priest and astrologer, to learn Hebrew from Benedetto Blanis in the Ghetto; Magnani soon emerges as the principal copyist in the Blanis family scriptorium (p.177). 1619 (late August) A son is born to Don Giovanni dei Medici and his (secret) wife Livia Vernazza; Ferdinando Magnani and Benedetto Blanis cast the infant’s horoscope—eliciting the vindictive rage of Raffael Gualterotti, the chief astrologer at the Medici Court (p.190). 1620 (January) Benedetto is accused of abducting the daughter of Josef Hezrà (later Cosimo Suettonio), a Jewish convert to Catholicism sponsored by Raffael Gualterotti; Hezrà is the husband of Virtuosa Blanis, from the Massa Carrara branch of the family (p.192). 1620 (February) Benedetto’s home is ransacked by the police; books and writings are seized, including his letters from Don Giovanni and a copy of the Ginat Egoz (a classic Kabbalistic text by Joseph Gikatilla) (p.195); Benedetto is imprisoned twice—by the Florentine civil authorities (February 7-12) and by the Inquisition (14 February) (p.197). 1620 (June 30) Benedetto is arrested and imprisoned for several years—in conjunction with the reversion to Judaism of David Finzi/Cosimo Tacca, an in-law from Massa Carrara; Finzi’s conversion to Catholicism was sponsored by Pietro Tacca—the First Sculptor to the Grand Duke of Tuscany, a native of Massa Carrara, and an influential figure at the Medici Court (p.206). 1620 (July - ) Salamone, Benedetto’s younger brother, emerges as the designated spokesman for the Blanis family—tirelessly lobbying the civil and religious authorities and the Medici themselves (p.204). 1620 (July 20) In Rome, the Pope and the Cardinals General of the Inquisition decide to proceed against Benedetto Blanis “for seducing recent converts to apostatize from the Faith”; the case was brought by Canon Francesco Maria Gualterotti—son of court astrologer Raffael Gualterotti (p.211). 1620 (late August – early September) Salamone Blanis travels to Venice in order to solicit Don Giovanni on Benedetto’s behalf; he recognizes that Don Giovanni is gravely—probably terminally—ill and out of favor at the Medici Court (p.220). 1620 (September 26) Benedetto writes the dramatic “Pasqua” note to Don Giovanni dei Medici and has it smuggled out of the Bargello Prison; this is the last suriviving communication from Benedetto to Don Giovanni (p.222). 1620 (late September) Grand Duke Cosimo II is in the throes of a terminal illness (he dies on 28 February 1621); Doctor Pompilio Evangelisti da Palestrina voices the widespread belief that the prince is expiring under a lethal curse; Benedetto Blanis is suspected (p.220). 1621 (July 19) Don Giovanni dei Medici dies in semi-exile in Murano; the Medici move quickly to eradicate any trace of his involvement with the occult; Livia Vernazza is sent to Florence and placed under house arrest; the Medici seek to annul the annulment of her first marriage, thereby invalidating her second marriage to Don Giovanni (p.228). 1621 (September 22; October 6); 1622 (January 19) The imprisoned Benedetto Blanis testifies three times before the tribunal of the Archbishop of Florence regarding Livia Vernazza’s affairs and his own role in obtaining the annulment of her first marriage. 1621 (October 12; November 10; December 14) The Cardinals General of the Inquisition consider the Blanis case—which has expanded to include various members of the Finzi family in Massa Carrara (p.234). 1622 (November 24) After repeated torture (in Florence), the Cardinals General (in Rome) fail to obtain a valid confession from Benedetto Blanis; they agree (at least in principle) to release him from jail on payment of a security bond (p.235). 1623 (6 January) Monsignor Filippo Maria Acquanegra, Commisioner of the Inquisition (in Rome) instructs Cornelio Priatoni (Father Inquisitor in Florence) not to free Benedetto Blanis “until you hear from us” (p.236). 1623 (August 30) The Florentine criminal court quashes a long-running suit regarding Benedetto and Salamone Blanis’ illegal usurious loans to Jacopo Sernigi; the Blanis family loses the huge sum of 1,500 scudi (p.110). 1627 (December 7) The Inquisition agrees to close the Blanis case if the accused will leave Florence; Benedetto moves to Ferrara, but continues to pay rent on an apartment in the Florentine Ghetto (p.237). 1647 (October) The lease on Benedetto’s apartment passes to the sons of his older brother Lelio, presumably after his own death (p.239).